Home � Animal Kingdom , Disney World Special Events , Recent � Taste Of Africa Street Party - The Food! Taste Of Africa Street Party - The Food! One of the best reasons to check out the Taste Of Africa Street Party at Disney's Animal Kingdom is the Food! This Street Party is a mini version of Epcot's Food & Wine Festival with a focus on foods and drinks from Africa. The best way to experience this party is in person, but until you have the chance to do so yourself, these pictures will have to do. There are 3 different locations to purchase tapas sized portions of African dishes, and one additional location to get fresh African baked goods and fruits. All 3 of the dishes ( all pictured above) available at the Kasafiri Bakery were excellent. The Berbere Rubbed Beef with Mealiepap (corn meal mash) was probably my favorite out of all of the Taste Of Africa Street Party offerings. 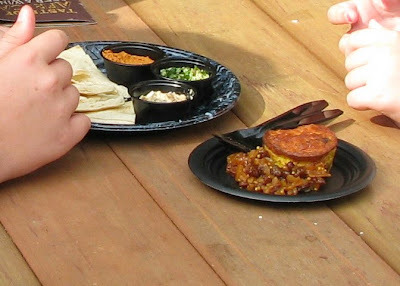 The portions were similar to what you would receive at the Food & Wine Festival and a special bonus is that you could use Disney Dining Plan Snack credits to purchase these if you so desired. We enjoyed the Avacado Shrimp Salad (pictured above), but it did not stand out above the items available at the Kasafiri Bakery. We tried both the Beef Bobotie with Blatjang and the Flatbread with Dips. The Flatbread comes with 3 dips (sundried tomato hummus, tabbouleh, and baba ghanousch) and is similar to what you can try at Sanaa at Disney's Animal Kingdom Lodge - Kidani Village, which is very good! The Beef Bobotie, which is a spiced meat pie accompanied by a dried fruit chutney reminded me of some kind of quiche. I thought it was good , but did not rank above the Berbere Rubbed Beef with Mealiepap. My kids thought the Mango Shake was great and sure hit the spot on a hot July afternoon. The baked goods are "imported fresh for the Taste Of Africa Festival." They looked good, but unfortunately we did not get to taste them first hand. They were also having fresh coconut prepared next to the stand which was fun to watch. If you enjoy the Epcot Food & Wine Festival then you will enjoy this African flavored version at the Taste Of Africa Street Party. With the great African inpired restaurants that you find at Disney World (Boma, Sanaa, Jiko, and Tusker House) it should be no surprise that they have great African dishes to try for this event. They were all good and represented a wide variety of tastes, flavors, and textures. The tapas sized portions were large enough and the prices were reasonable (for Disney World). I would highly recommend attending this event if you have the opportunity! 0 comments to "Taste Of Africa Street Party - The Food!"